THE silence of nature was broken by someone or some thing galumphing through the woods. Rustle. Rustle, rustle, rustle. Rustle, rustle, rustle, rustle. I paid it no mind. I was enjoying a tranquil hike through Sawpit Canyon along the Ben Overturff Trail in Monrovia. I had reached the end of the trail, a place called Deer Park, a place where former Monrovian and Los Angeles County deputy sheriff Ben Overturff had built his lodge back in 1911. It fascinates me how the pioneers of the Great Hiking Era (1900-1920s) picked their sites out of thousands of acres of wilderness to build their cabins or mountain hideaways. This one was in a clearing, a kind of oak woods nirvana, where the sun broke free from the lower canopy of alders and bay laurels and where the winds and Im told, the waters of the great flood of 1938 can converge freely. 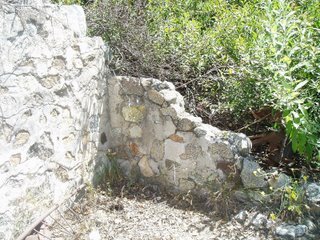 Often, these wood or stone structures became resorts, attracting thousands of visitors who would trek in by foot or mule on a Sunday afternoon for a meal.Sometimes hikers could smell the homebaked pies or see the smoke winding from the stone chimney before theyd reached their destination.A few feet down the path from the Deer Park cabin site was the mother lode of ruins. The original stone foundation and walls built by Overturff about 100 years ago. I climbed in and snapped away with my digital camera, filling up the memory card. I heard it again. This time the sound was much closer. The sweat rolled down my back and a cool breeze raised goose bumps on my skin. Normally, a delicious feeling after a rigorous hike in summer. I couldnt ignore the sound anymore of the forest visitor. I yelled out Whos the but stopped myself. It wasnt another person. I had seen no humans in the 2-plus hours on the trail. And theres no other way in.I did see a deer, a full-grown doe at the junction of the trail and fire road a while back, who stared me down like a bull facing a matador. But it finally moved quietly into the camouflaged brush like a soldier in a guerrilla war. Mountain lion? Nah, they dont make that much noise. Theyre sleek and stealth and usually come out at night. Coyote. Again, this would have to be some large coyote to make that much noise. It was like the sound of a drunk stumbling through the bar, bouncing off tables and toppling glasses. There was nothing delicate about that noise.There was only one critter left on my list of possibilities. Bear. North American Black Bear. Ursus americanus. I started back down the trail with a new determination in my step. Then I saw him. He was a big, black bear, about 50 yards up slope, foraging for food. I could see his tan fur, sleek but matted at the belly. His brown nose canvassed the leave-strewn carpet for food. No cubs, so I assumed it was a male. He didnt see me and I froze. I fumbled for my camera but the memory card was full.My mind raced. It started playing tricks. It went to Tony Sopranos last TV moment, and my world abruptly faded to black. I nearly shouted out Mom! Mom! Mom! Its not right, but stopped myself after realizing that not my mother, nor Sheriff Lee Baca, would be coming to my rescue. Then I tried to remember what I was supposed to do. I tried to make myself appear big. Not easy for a guy whos 5-feet 8. Dont run, I thought. Dont let the bear see fear. Again, not easy for someone who was still waiting for his life to flash before his eyes. You are supposed to make a lot of noise, was the advice of co-worker and former Boy Scout leader, Ron Berry. The movie that played in my mind was that documentary of the guy who fell in love with the bears up in the Aleutian wilderness, Timothy Treadwell. He went back one too many times and ended up as lunch. I decided not to befriend the bears, as Treadwell, but instead, to high tail it out of there. I walked, albeit briskly, past the large mammal, and took advantage of the trails sharp descent. I didnt run, but didnt stop until I reached Twin Springs. There, I ate the apple that was in my backpack, the one I worried Mr. Bear would smell and jump me for. The sweat rolled down my back and this time, it felt good. As the kids would say, no fear. FILMMAKER Woody Allen famously dissed Los Angeles in one of his films by saying the only cultural advantage of living in LA (vs. New York City) is that you can make a right turn on a red light. Harsh. But having lived in both places, I can say theres some truth to his crack. But that same kind of NY-CA snobbery I may be guilty of can be applied to LA Countys westside vs. eastside rivalry. Westsiders say theyve got a cultural advantage over us here on the eastside. Theyve got Santa Monica, Third Street, The Getty, UCLA, the LA County Museum of Art and if you throw in downtown, Dodger Stadium and MOCA. My colleague Larry Wilson, editor of the Star-News, would argue the Pasadena area (part of the eastside) is no slouch when it comes to culture. It has the Norton Simon, Old Pasadena, the Huntington Library and the Rose Bowl. He would have a point. But for arguments sake, Ill give the cultural IQ to the westside. Plus, theyve got the beach. But us on the eastside of the basin have a geographic advantage. We are centrally located. You can live in the San Gabriel Valley (or the Whittier area) and be almost equidistant to any of LAs or Orange Countys cultural institutions, stadiums, venues and destinations. From my house in Temple City, which is centrally located within the San Gabriel Valley, I am 34 miles from UCLA and 37 miles from Cal State Fullerton. Amazing. It is just a few more miles to Santa Monica Pier and again, just a few more miles south to Anaheim/Angel Stadium/Disneyland. San Fernando Valley? Very close by, just a hop skip and jump to Universal Studios, City Walk or Hollywoods sights. When my East Coast friends come out to visit and stay with me, it is geographically convenient to take them to all these LA and OC landmarks. They are equally as close. My guests are closer to everything than if they had stayed on the westside or in Orange County. What small businesses like to say is the most important thing to success, the San Gabriel Valley has in droves: location, location, location. But that geographic advantage is slipping away nearly erased due to traffic. It is the freeway gridlock not just during commute hours but more often on Saturdays and Sundays that is taking away one of the San Gabriel Valleys most precious advantages over the westside. SGVers have let traffic affect their choices in entertainment, in careers, in friends, even in baseball clubs. Traffic is killing our geographic advantage. Like the frog in the lukewarm water, our best location advantage is slowly dying only we dont know it. And with it, some of our identity dies too. I told a friend from SoCal (now living in Northern California) I enjoy going to restaurants in downtown LA.You go to dinner in downtown LA? Where? he said in disbelief. Its less than 10 miles away! Yet because of traffic weve stopped going there. I had the day off and took my son, Matt, 17, to visit and tour UCLA. I reached Kerckhoff Halls parking structure after only 34 miles. With morning traffic it took us 1 hour 15 minutes. My wife and I hitched our bikes onto her car and drove to Santa Monica Sunday morning in less than 45 minutes. With very little traffic the distance to the westside grows short. Its the traffic that colors our perception of distance. Its the traffic that caused us to measure car trips in hours, not miles. Were one of the few people groups to do that. My friend Rich in Irvine loves the LA Dodgers because he grew up in LA and his father was a Dodger fan. But recently, the bottlenecks and heavy traffic he encountered along the drive up Interstate 5 to Dodger Stadium (not far in distance) caused him to attend an Angels game with me in Anaheim. He even bought an Angel cap! Can traffic change our loyalties to a sports team, some of the most ingrained social programing in the human psyche? The answer is yes. One last example. My nephews wife is a graphic artist working at a company in Orange County near where they live. She doesnt like the job but wont consider the possibilities of working at an LA firm because she fears spending hours each day sitting in traffic. Isnt that what Orange County (or the SGV) was built as: a bedroom community for companies in LA? Now, even that suburban model is breaking down. Traffic is not just spending more time in a car and less time at home. It is a cancer that is slowly limiting careers, changing lifestyles and stealing our advantages things that once made us as a Valley attractive.